As our Winter Outlook series continues, we turn our attention to the polar jet stream, which will largely determine how much of this winter's precipitation will fall in a frozen form and how cold our temperatures might get. 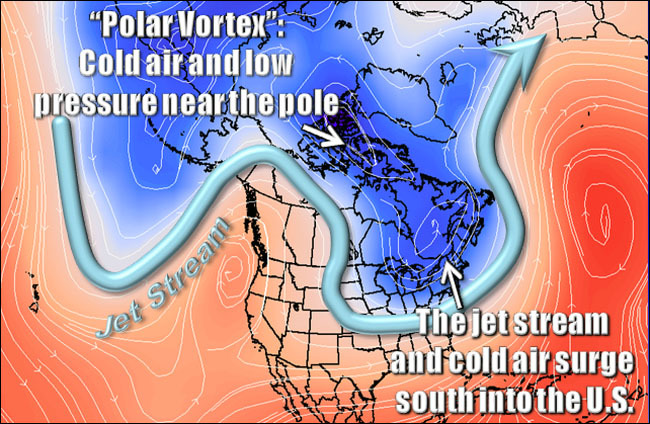 In many ways, the polar jet stream -- controlled by the now-infamous polar vortex -- can be thought of as the gatekeeper to wintry weather in the Southeast US. A stronger polar jet stream means stronger westerly winds and little deviation in the jet pattern at high latitudes, which bottles up cold air up near the North Pole and keeps the gates closed to prevent that cold air from advancing to the south. However, a weaker polar jet stream (pictured on the right) has more deviations in its path, which can send pieces of the polar vortex and cold, Arctic air much farther south, including over the Southeast. This also enhances our chances for winter storms as the potential for interaction between the subtropical and polar jet streams increases. During the past two winters, North Carolina has seen impacts from a piece of the polar vortex dislodging and surging southward, with severe cold in January 2014 and a period of cold, wintry weather in February 2015. We often describe the strength and position of the polar jet stream by discussing the phases of the Arctic Oscillation (AO) and North Atlantic Oscillation (NAO). A negative phase of each is associated with a weaker polar jet and a blocking pattern to our north that is favorable for wintry weather in North Carolina. Unlike ENSO, we can't accurately predict the AO and NAO phases months ahead of time since they evolve over the course of days or weeks. However, research in recent years has identified three atmospheric precursors of a negative NAO phase. A study by Garfinkel, Hartmann, and Sassi (2010) found that about 40% of the variance in the wintertime polar vortex can be explained by El Niño, October Siberian snowfall, and stratospheric winds. The combined effects of these patterns help establish a strong high pressure system over eastern Europe, a low pressure system in the north Pacific, and a weakening of the polar vortex from the top of the atmosphere down. Here's how each ingredient plays a part and how they stack up this year. 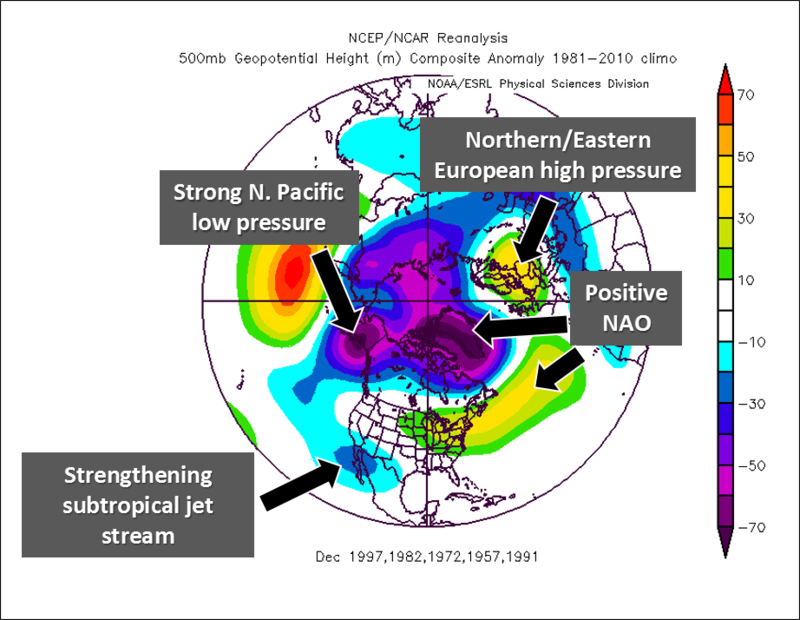 Typical December upper-atmospheric features during strong El Niño years. As we've already discussed in this year's Winter Outlook, one of the strongest El Niño events on record is in place, which should mean an active subtropical jet stream this winter. El Niño can also affect the polar jet stream, although in a more roundabout way. As the map of 500 millibar height anomalies -- basically, upper-level high and low pressure systems, or troughs and ridges in the jet stream -- on the left shows, one prominent upper-level feature during strong El Niño winters is an anomalously strong low-pressure system in the north Pacific. Like a rock in a stream of water, this strong North Pacific low disrupts the upper-atmospheric flow pattern. The ripples from this disturbance help prevent the polar vortex from becoming strong and closely bound to the North Pole. This North Pacific low often sets up in December, so if we see it take shape this year, that may be a good indication that El Niño's impacts on the polar jet stream are present. A theory first proposed more than 15 years ago by Dr. Judah Cohen linked the rate of increase of Siberian snowfall in October with large-scale atmospheric responses in the following winter. 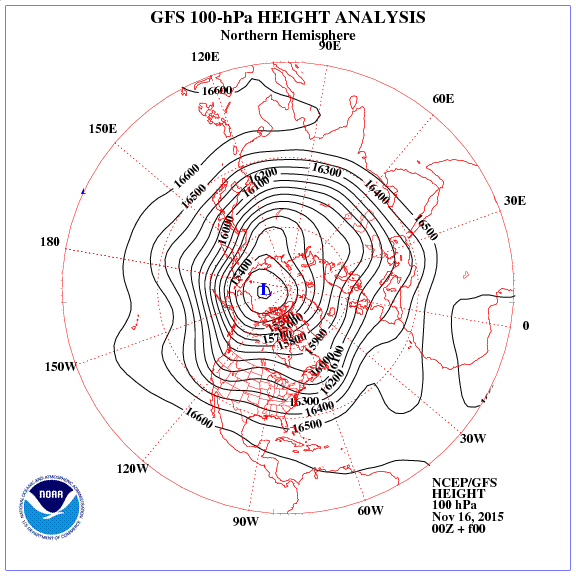 As snow builds up over Eurasia in the fall, the surface cools but the upper atmosphere warms. This helps establish a semi-permanent high-pressure system over eastern Europe. 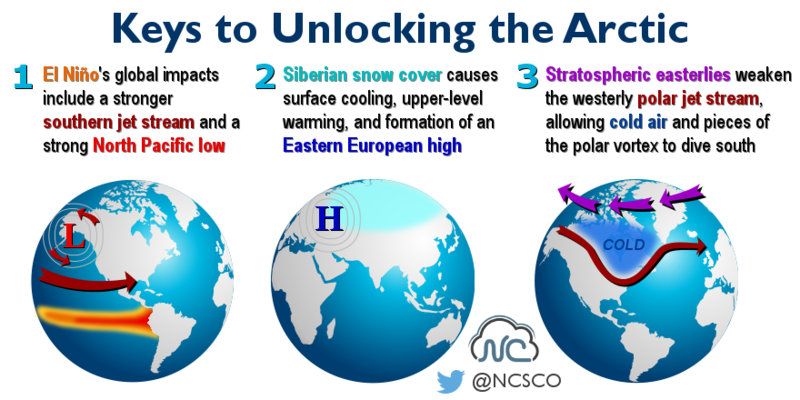 Similar to the impacts from El Niño, this high -- along with the cooler surface temperatures farther south across central Asia -- can disrupt the upper-atmospheric flow and weaken the polar vortex and polar jet stream. 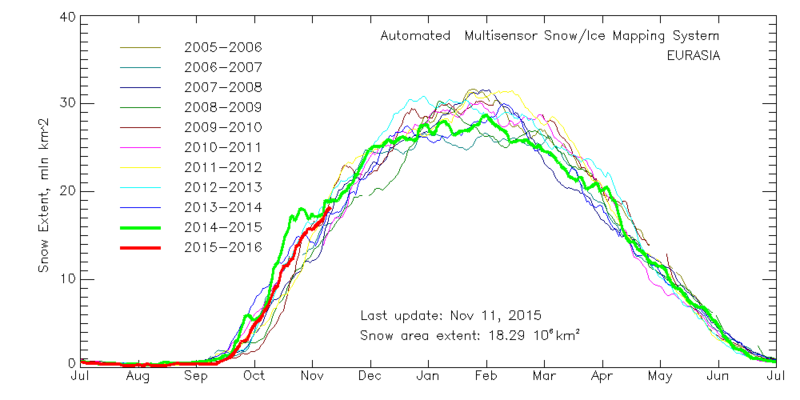 This October, snow fell across Siberia at a steady and often rapid rate. The month finished with the 6th-highest snow cover out of the past 48 years. Although that's not as high as last year, when the October snow cover ranked as the 2nd-highest, atmospheric El Niño impacts that were missing last year are now present, which should bolster our chances of seeing a favorable polar jet stream pattern. 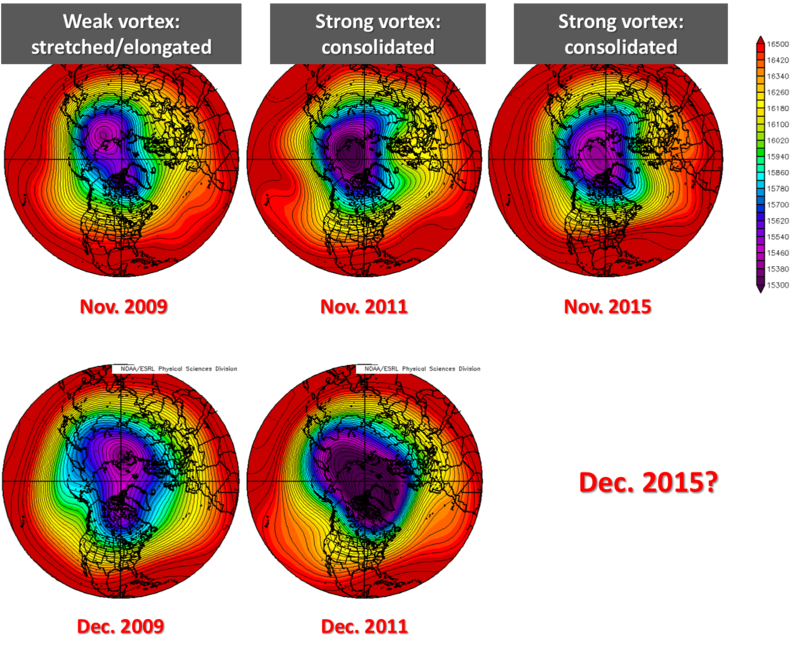 In last year's Winter Outlook, we introduced the idea that winds in the stratosphere -- measured by the Quasi-Biennial Oscillation (QBO) index -- propagate downward to the jet stream level and influence the strength of the polar vortex from the top down. Last fall, those upper-atmospheric winds were strong easterlies (a negative QBO) and we expected that as they reached the level of the westerly jet stream, they would weaken the polar jet stream and polar vortex. That didn't happen during the winter, but it finally occurred this summer, and we saw a strongly negative AO and NAO in July once it happened. Since then, those stratospheric winds have become westerly and the October QBO value was the most positive ever measured during that month. With that in mind, we expect the polar vortex will remain strong like it is now through December, which is often the case in the early winter months. After that, the conditions are less certain. It's worth noting that past years with the strongest positive October QBO values had a more favorable jet stream pattern later in the winter. Once the atmospheric impacts of ENSO and Siberian snowfall have had time to set up and act on the polar vortex this winter, we could see a similar pattern shift by January, even without a favorable QBO phase. This fall, we've seen two out of three precursors for polar vortex weakening: El Niño conditions and above-normal October Siberian snowfall buildup. Their atmospheric footprints are also showing up in the latest global observations, which may be setting the stage for the polar vortex to weaken through December and early January. If this happens, it could eventually allow for pieces of the vortex to detach and move southward -- similar to the last two winters -- opening the gates for cold air outbreaks and the potential for wintry weather likely beginning in January. This polar pattern accompanied by a negative AO and/or NAO pattern would favor wintry setups for the Southeast. If a sustained period with a negative AO and NAO phase were to develop this winter, the potential for a severe winter storm -- while still relatively low -- would be much higher than normal based on the likelihood of an active southerly storm track and the availability of cold air. Of course, even with these ingredients in place, there are no guarantees in North Carolina winters until flakes are actually falling.